This entry was posted in hypothetical quotes. Bookmark the permalink. This reminds me of my ex. 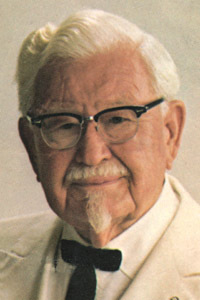 I wonder who would win in a fight, the Colonel or Orvell Reddenbacher…hmmm. In their younger years, the Colonel, without a doubt. But I think in their advanced years, cleaner living would have given the advantage to Mr. Reddenbacher. And I really don’t want to associate the Colonel with the phrase “crotch licking”. At all. Wow, Colonel, who knew you were so… liberated? But please–liberate somewhere else. That’s just eewwww. Crabby enough, but highly unlikely. This will be an excellent series, I can tell. Except, you’ve started out with the bar set pretty high (or, uh, low)! Falwless, I have opened up my Twitterings to the unwashed masses again. Just try taking a bath now and then, okay? Fran, rinse that throw-up taste out with delicious mashed potatoes and gravy! bradda, that is a question for the ages. bubs, should I have had Orville say the crotch-lickin’ line instead? dc, the Colonel can do what the Colonel wants. freida b, or “not at all”. BSUWG, sadly, it already is a series (albeit one I stopped doing months ago).